Males will have longer fins and a slightly more angular head. 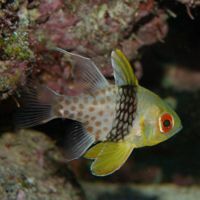 Do not keep with other Cardinalfish, can be kept in groups of Pyjama Cardinalfish to avoid aggression. Should be peaceful towards other fish. Do not keep with territorial or aggressive fish or inverts. Prefers meaty foods such as mysis shrimp and brine shrimp, may take prepared foods also. Needs an SG of 1.020-1.025. Hiding places are essential as well as open swimming spaces. Some Pyjama Cardinalfish will tend to hide in sea grass or other plants. Some may also camouflage themselves against Diadema setosum. A fairly peaceful fish, not overly active. Similar to the Bangai Cardinalfish in shape, this fish has a silver base colour, with a yellow face, dorsal, pelvic and pectoral fins, there's a thick black stripe running vertically down the centre of their flanks and into the base of the dorsal fin. On the hind part of this stripe the fish is spotted with orange, and they have rich red/orange eyes.